*Rental Dates – Select service start date as your 1st FULL day at the beach NOT your check in date! *Weekly rental is SIX days. 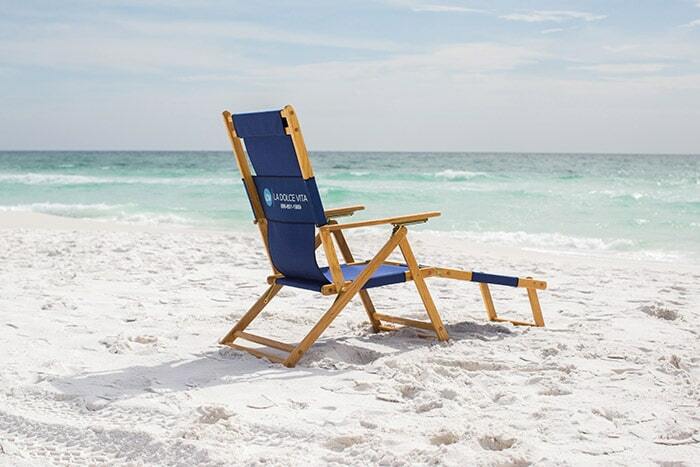 Beach Chair Setups offered for rent at most locations & select delivery areas in Destin, Miramar Beach, South Walton & Navarre. In our industry the term Beach Service typically refers to chair and an umbrella rentals placed along the shore. Although it’s a common term, the quality of the each beach service offered in Destin does very. La Dolce Vita offers the finest beach equipment, maintains it’s equipment, and hosts professional and polite staff. In addition to have many beach service locations in Destin, Miramar Beach, and South Walton we also deliver chair and umbrella rentals to select locations. If you are not staying at one of the resorts or communities we operate in give us a call and we will let you know if delivery possible. The service was phenomenal. Louis and Wyles helped us rent chairs and umbrellas for the week and then had them set up and in the location we requested each day. They also helped me with our beach gear when I only had my little ones with me. They also helped when we rented a paddle board by bringing it to our location and instructing the kids on the finer points. There were also many other water sports offered at their next hut. Jarrod and crew did a great job with getting our sons licensed for boating and were very helpful with the jet skis and banana boating. Thanks for being kind, helpful and considerate of all the age groups we had! Thanks for making the king vacation from Ohio so enjoyable! We have used a different company in past for beach set ups. This year we couldn’t find them and saw several different Co umbrellas to call. First one we called was not very helpful in describing their services, options etc. Thank goodness we found Andrew with La Dolce Vita on the beach!! Very informative & helpful in describing options for chair set ups & other rental options such as paddle boards. He took care in making sure we were happy with set up location. Chairs umbrellas were quality. Highly recommend giving them the option to help you with beach set ups and/or rentals for paddle boards, etc. Posting this after a 10/10 day on the beach thanks to LDV. Service was great, chairs, table, etc all is great quality, which hasn’t been my experience with other rental companies. Ross was super helpful, even helped my wife with the baby formula while I was in the water with the other two. Thanks LDV! This company is very good and guys on the beach are wonderful!! Louis and Wiles have always treated us well. Great company. LDV is a great operation. They can satisfy many beach needs with quality products and great customer service. The personnel on the beach are great guys that go above and beyond. Again, a comprehensive and well-run company. Whatever they do, they do well! Your privacy is very important to us. Your name and email address will never be shared or sold. La Dolce Vita is the premier beach service company in Destin, Florida and along the beaches of the Emerald Coast including the beaches in Miramar Beach and along Scenic Highway 30A in South Walton. Enhancing your beach vacation, our company provides a wide range of rental equipment offerings on the top beaches, waterways, and resorts in and around Destin.